PlanSwift is the fastest and easiest takeoff software available. Takeoff and Estimate in seconds, if it’s colored it’s counted. Drag and Drop material and labor assemblies onto your takeoff. Sharing your estimate is easy, and PlanSwift is fully Excel compatible. Just Point & Click and your takeoff is done. Takeoff simple or complex areas, items, lengths, volumes, perimeters in seconds, if it’s colored it’s counted. Drag & Drop pre-configured Assemblies (materials, waste and labor costs) onto your takeoff items and PlanSwift instantly calculates all your costs and expenses. 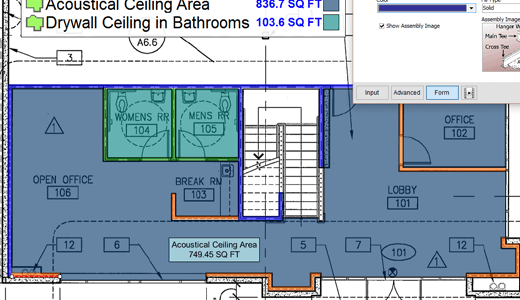 This Drag & Drop feature will greatly increase the accuracy of and reduce the time it takes to Estimate a job. PlanSwift instantly calculates material, waste, labor, etc. You no longer have to wonder if you have done the calculations for a specific area or not. It’s done as you create it. Export your Takeoff / Estimate to Excel or use the built in Reports. Either way you know the entire job has been calculated and is ready to go. Labor is calculated right along with the materials. Labor hours and cost is often guessed. Not anymore. We downloaded the trial and were immediately blown away. It is perfect for takeoffs which is what we need it for. It has saved us time and money and is dead on accurate. The tutorial and customer support is awesome. Great product and we will be using it for a long time to come. PlanSwift is easily customized for you and your specific trade. Simply create assemblies of commonly used materials, waste and even labor. Then drag those assemblies onto the takeoff items for instant and accurate estimates of all your costs! 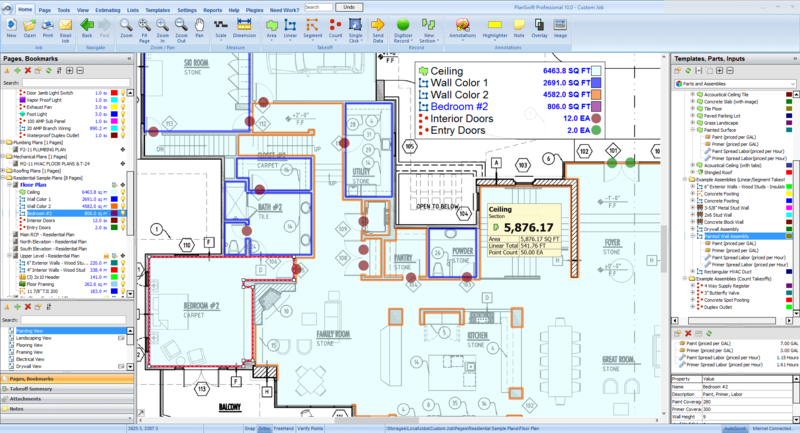 Want more information about PlanSwift Takeoff Software for General Contractors? 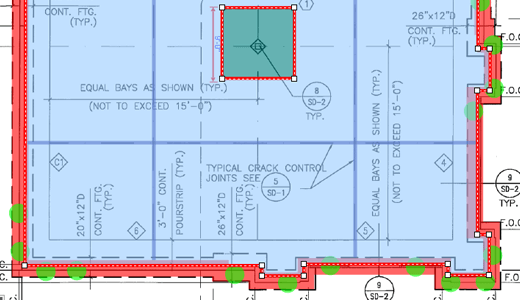 Takeoff footings, walls and foundations measurements quickly and accurately. 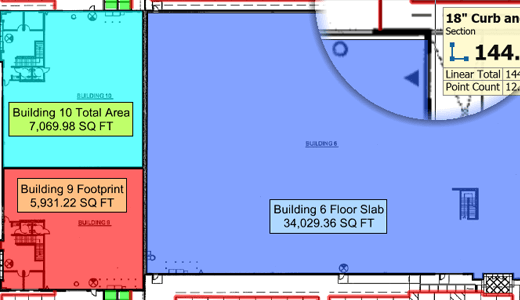 Simple Single Click selection for for slab dimensions.. Custom pre built assemblies accurately project rebar, membranes and other materials and labor. 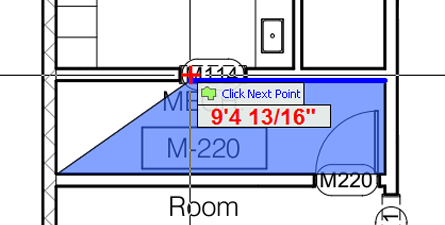 Simply point and click to measure walls, ceilings and partitions. 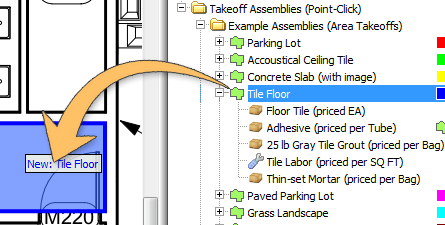 Calculate your square footage and surface areas quickly with our area and linear tools. 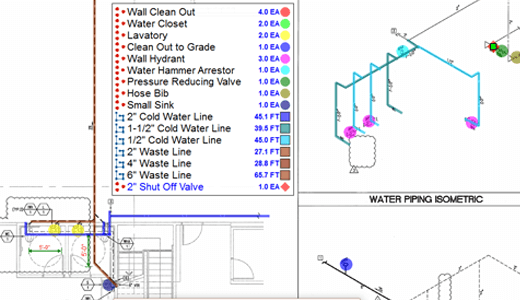 PlanSwift automatically calculates materials and labor for a perfect estimate, every time. You’ll make more accurate estimates much quicker, saving time and money! Adds total number of switches and receptacles with ease. 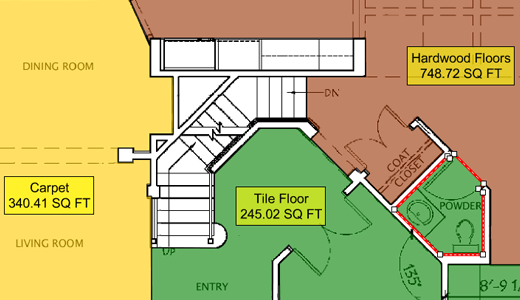 One Click area select for tile,carpet , hardwood or laminate floor areas. Speedy perimeter measurement for nail strip and baseboard needs. Measure, count, calculate, print or export your estimate with our easy takeoff software. Estimate more accurately in less time. Bid and win more jobs. Measure joists, rafters, studs, headers, etc. Count posts, connectors and more. Calculate labor, waste and equipment hours. Print or export your estimate with our easy takeoff software. 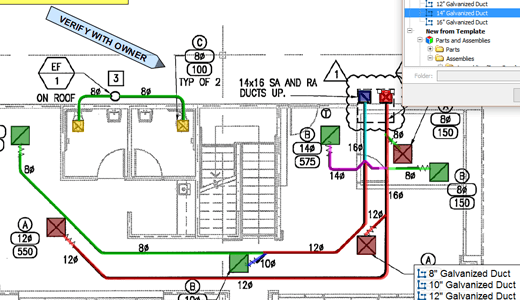 Quickly trace linear takeoff for A/C supply lines. 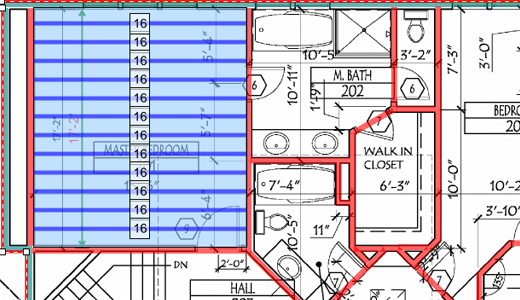 Instantly derive volume of rooms for heating and cooling. 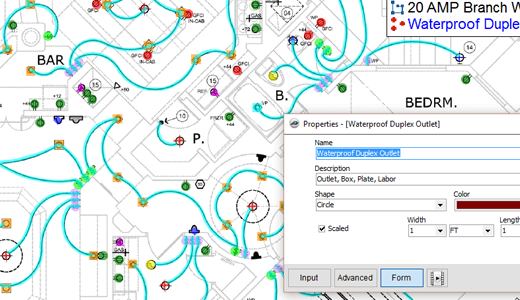 Generate precise material lists for HVAC assembly and instantly calculate cost. Do faster takeoff estimates that are mistake free! 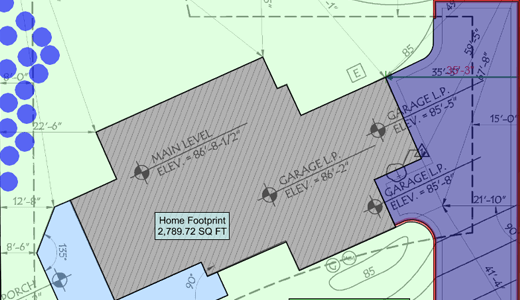 Easily measures square footage, volumes and linear dimensions, even if the “linear” is curved. Get instant, accurate area dimensions for sod, mulch, gravel and other products with a Single Click. Get an accurate professional estimate with a point, drag and click. Faster, more accurate estimates save you time and help your bottom line! 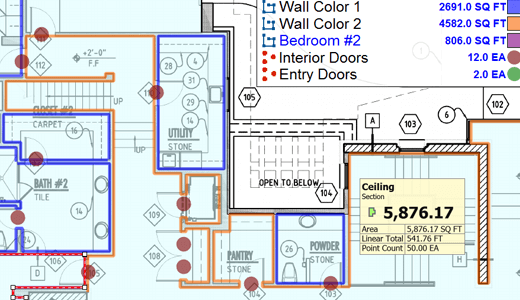 Single click area select tool instantly measures every wall and ceiling surface – straight or curved. 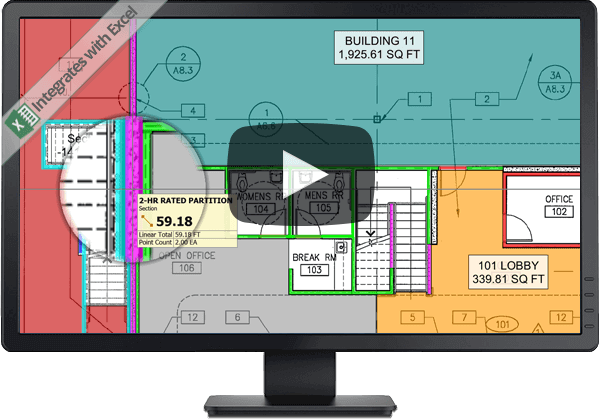 Simply drop pre-built custom assemblies onto the takeoff for instant estimating. Everything is counted and calculated including paint, primer, labor and materials for the job. Spend less time estimating, bid more jobs and maximize earnings! Swiftly measure linear feet for CPVC, drain and supply piping. Get accurate instant takeoff counts for fixtures and fittings with point and click ease. PlanSwift calculates everything for a precise estimate every time. PlanSwift makes takeoffs easier, faster and more accurate no matter what your trade or job is. Rest assured, with PlanSwift all of your needs are covered. Here are a few trades that aren’t listed to the left. We will be adding more trades pages in the near future. So, check back often. The fact that it costs about a third of the other company’s product helped my decision to purchase PlanSwift, but I have to tell you that the TUTORIAL is what won me over. Excellent customer support and a better price. What more can I say? It’s a great product, with a great foundation that can be built upon to grow and become better and better for years to come.